Engine power characteristics can be changed in 3 modes by operating the drive mode selector to meet various riding conditions and rider’s preference. Drive mode is preset at a-mode when the ignition switch and engine stop switch are turned on. Follow the procedure below to operate drive mode selector. Turn on the ignition switch and engine stop switch. Push the drive mode selector to change drive mode. switch can change from a to b to c to a. The drive mode indicator indicates actual drive mode. operating the drive mode selector while riding with the throttle opened will change the engine speed because of engine power characteristics change. Drive mode indicator blinks when drive mode change operation is failed. Turning off the ignition switch or engine stop switch will return the drive mode to amode. Start the engine and reset the drive mode. 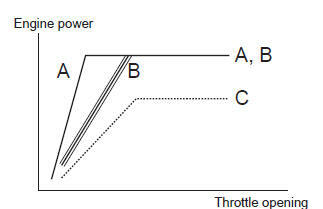 A-mode provides sharp throttle response at all throttle opening range to obtain maximum engine power. B-mode provides softer throttle response than a-mode up to middle throttle opening range. 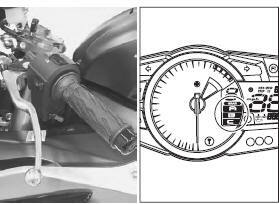 C-mode provides soft throttle response at all throttle opening range by reducing engine power.